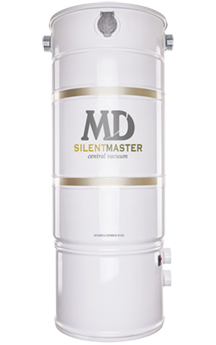 Silent-Master Central Vacuum Customer Ratings and Reviews - MD Vacuum. Although this is the third motor and the second unit in 3 years, the company has stood by their warranty. Hopefully this new unit will perform well. After 4 years the unit is still going strong. We love the unit as it is powerful and clean. This is our third unit on our third house in the last 43 years. Wouldn't have any other central vacuum. These are THE BEST. Love my Silentmaster vacuum - this is the second house I have had it installed in. This is our second SilentMaster - the first lasted 22 years, and not longer only because we decided to buy a new one instead of replacing the motors. Excellent vacuum, quiet, powerful. 240v version extra power. great vacuum, quiet, powerful and easy to use. Great system. Much better than one installed in the house before. Simply the best central vacuum system around! By far the most powerful with fantastic suction and is the quietest central vacuum I have ever had! My husband can actually work in the garage when I am vacuuming inside our home. I would rate this vacuum with ten stars, not just five! Much more quiet than old system and more powerful. Only replaced the old one because a mouse chewed the wires. This one is wireless. Would never go back to a regular vacuum again. The vacuum does a good job. However, I do not like having to plug in a separate cord for the power. My previous vacuum had the electrical cord built into the handle. Love the built in the wall hose. Very strong.